Thank you for the info guys. I know this is really outside what the gator Navy’s purpose is. However, between Iran’s threats to the straits of Hormuz and the Russian Navy off Syria, there would seem to be a need for some sort of US naval force projection in the Middle East, and since there’s no CVN CBG in the theater, Essex and her F-35s would appear to be the most potent surface assets we currently have there, and I was curious how potent they are. Otherwise, I assume any DDGs or CGs operating would have to depend on the USAF for air cover. tjh8402 wrote: Theoretically, what weapons would these Bs be ready and able to employ? A 500lb Paveway will fk up a moving ship and a 2k JDAM will lay waste to a stationary one. SpudmanWP wrote: A 500lb Paveway will fk up a moving ship and a 2k JDAM will lay waste to a stationary one. I believe that you meant a 1k JDAM since we're talking about the F-35B, no? JDAM doesn't work that way ie. not network-enabled. A LJDAM would have a better chance of hitting a moving ship. I believe that you meant a 1k JDAM since we're talking about the , no? You're right, I was getting ahead of myself on what was cleared in SDD for external carry. "The Marine Corps’ F-35B Lightning II Joint Strike Fighters are the only ship-based fixed-wing aircraft in the Middle East right now, and service leaders say the new jets are ready to handle any fight in Syria, Iraq or Afghanistan they may be tasked with. Though the F-35Bs have never seen combat before, they are now the only available fighters from the Navy or Marine Corps in the region, and service leaders say they are not going to ease the F-35 into operations. 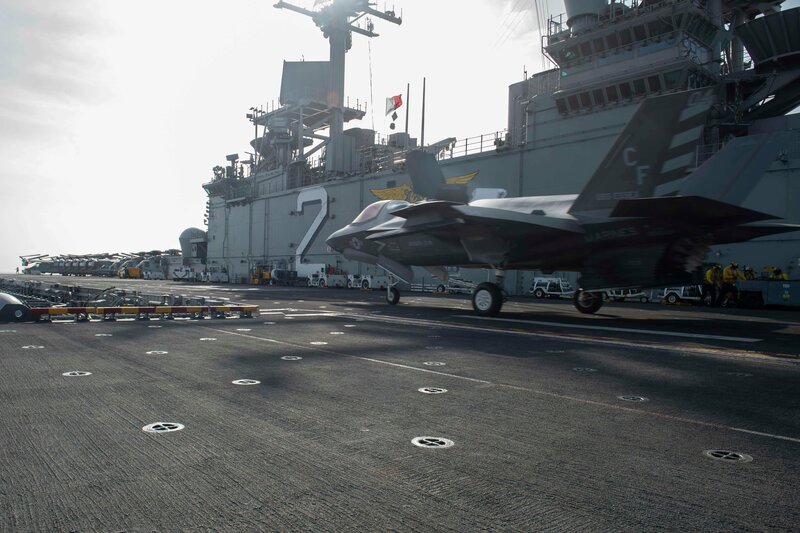 Whatever 5th Fleet and U.S. Central Command leadership asks of naval aviation, the F-35Bs deployed with the Essex Amphibious Ready Group and 13th Marine Expeditionary Unit will be ready to handle, they say. “The deployment of the F-35B into U.S. Central Command is a major milestone for the program and validates the aircraft is in the fight right now, conducting real-world operations; it is actively supporting combatant commanders. We look forward to demonstrating the capability of our newest, advanced stealth aircraft during this deployment,” Capt. Christopher Harrison, a spokesman at Headquarters Marine Corps at the Pentagon, told USNI News. ...During this amphibious force’s time in 5th Fleet, the Essex ARG and 13th MEU will do what most other ARG/MEUs do during their deployments: they will train with partners’ militaries, they will conduct sustainment training, and they will be ready to respond to crises that arise, as well as support the named operations in the Middle East if called upon. The presence of the F-35s doesn’t change any of that, Gibson said, but she added that leaders were excited to show off the new capability and approach each task with a more sophisticated weapon. “The ARG/MEU team will participate in exercises and, as tasked, combat operations during their deployment in the U.S. 5th Fleet area of operations. From these exercises and operations, the Navy/Marine Corps team will demonstrate the capabilities that the F-35B brings to the ARG/MEU and how to best employ those capabilities,” she said. Photo: "An F-35B Lightning II, attached to the “Avengers” of Marine Fighter Attack Squadron (VMFA) 211, launches from the flight deck of Wasp-class amphibious assault ship USS Essex (LHD 2) on Sept. 2, 2018, during a regularly scheduled deployment of Essex Amphibious Ready Group (ARG) and 13th Marine Expeditionary Unit (MEU). US Navy photo." SM-6 from any Mk-48 afloat. Don't think the current aircraft in the field are 3F yet but even with 2B, that's JDAM, AMRAAM + PW2. Also seen pics of external AIM-9s on the Bs on the essex which per the list is a 3F capability though I think its probably 3i. Are there any pics of the B with the gun pod? IIRC all the SIX F-35Bs aboard USS Essex are 3F. Early F-35Bs were not - later squadron F-35Bs are so enabled specifically. Boeing [NYSE: BA] successfully demonstrated the capability of a single F/A-18E/F Super Hornet to engage moving land targets during a test at Naval Air Warfare Center, Weapons Division, China Lake, Calif.
"This is just another step in our efforts to develop an all-weather multiple moving target engagement capability for the Super Hornet," said Chris Chadwick, Boeing vice president for F/A-18 programs. "We plan to expand on this effort, to meet the goals of precision multiple moving target engagement envisioned in Sea Power 21." Real-time targeting updates were accomplished using the aircraft's existing Digital Communications System (DCS) to communicate over a standard military link to a 2,000-lb. Joint Direct Attack Munition (JDAM) equipped with a UHF weapon data link module. The weapon data link module included a miniature radio transceiver that transmitted link status back to the aircraft during weapon free-fall. In the guided release demonstration, the position of the moving target, a radio-controlled panel-side truck, was continuously tracked by the Advanced Targeting Forward-Looking Infrared (ATFLIR) sensor onboard the Super Hornet. Periodic target updates were provided to the JDAM throughout the weapon's flight to the target. As a result, the F/A-18 weapon system successfully guided the inert bomb to within two meters of the moving target -- close enough to destroy most moving targets. During a previous flight, two-way UHF link connectivity was verified to 40 miles between a ground-mounted JDAM and aircraft in flight. 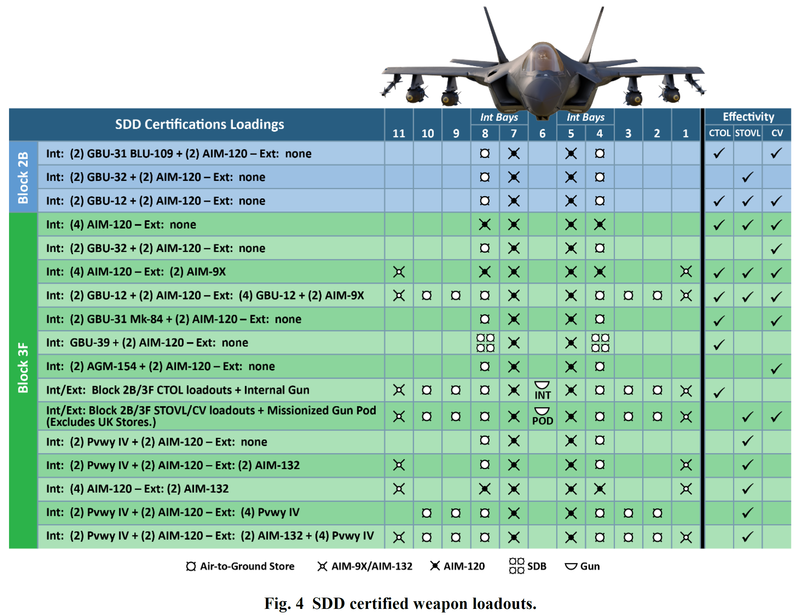 The UHF weapon data link exceeded expectations in maintaining communications between the F/A-18 aircraft and the JDAM during weapon deployment. Further demonstrations of the Super Hornet's future precision engagement capabilities are planned for later this year and 2006. As you can see, it even had a rather good precision (2 meters). Now my point was: Is something like this integrated within the F-35 and JDAM? Honestly I also don't think it is but the fact is that I'm not 100% sure. If this isn't implemented/integrated than maybe the reason is like you said, because of newer weapons which are probably more effective in dealing with moving targets like the LJDAM that you mentioned or the EGBU-12/GBU-49, the later of which is being integrated on the F-35, right? They may have tested a data link for JDAM but apparently it never made it past the proof of concept, the Navy likely scuttled the idea. I think a swarm of SDB-2s would be interesting. The Paveway II (500lb GBU-49) can be used for moving targets at 3F and 400 have been ordered. Doubt any are on board though as they should just be receiving this order about now. I did not find where a destroyer was with the MEU. From that point would not 2 be good to have in the MEU? This would give them a known platform for the SM-6 against stationary or moving targets as fast as a fighter jet. Then the magazine well of 1 F-35 would be however many SM-6s they chose to fire up to capacity. What other stovl jet can match this load out? With the lack of F-35 communications with the ship commander could he not just go jump in one F-35 on the deck and get his picture? Need others to see it? Use the ship’s wifi and a smart phone with FaceTime. Need more ships in the MEU to see it too? Pump the data stream through the ship to ship connection then into an iPad and join the call or just view. You simply make due with what you have. Don’t have WiFi? Get a wireless router. Don’t want to use WiFi at all? Get a network cable out to the plane and use an Apple laptop at the ends of the FaceTime calls to each participating ship. If FaceTime requires connections to Apple servers use Skype or some program designed for network video calls/monitoring like ipwebcam. Can the ship already do ship to ship video calls? Use that setup pumped to and from the plane. AFAIK there has only been a proof of concept for an F-35B directing fire for an SM-6 and that was from the 'desert ship'. Provide a reference that this capacity is operational please. The USN were going to do the same from a ship at sea however I do not recall that this test has been carried out or reported so far. IF so please provide a reference. Thanks. BTW 'make due' is not a thing. MAKE DO would be the term. Make DEW is also altogether something else not relevant. spazsinbad wrote: BTW 'make due' is not a thing. MAKE DO would be the term. Make DEW is also altogether something else not relevant. Thank you for the correction. I appreciate it and hope to make do. I served as a unit armor in the Army. For us operational ment “you can do it? Go do it now.” Maybe I served at a time that is different than today’s environment.